Upon reaching Account Level 7, a player is granted the ability to assign a Commander to each ship. Commanders can learn a variety of useful skills that enhance the performance of the ship. Sometimes these are straight buffs to the vital statistics of a ship — such as faster turret traverse speed or more hit points — while others confer entirely new abilities or tools for the player to use in combat. A highly skilled commander is among the most powerful upgrades a ship can obtain in World of Warships, working together with installed upgrades, chosen consumables, and equipped signals to enhance the performance and capabilities of the ship. Send to a Senior Commanders Course for 25 to earn three (3) skill points. Send to the Naval Academy for 7,500 to earn one (1) skill point. Be content with Basic Training at no cost for zero (0) skill points. Clicking the small, circular icon below the commander's name (middle left) in the recruitment window generates a new name and portrait for the commander. This can be repeated until the player is satisfied with the combination. Recruiting is not the only way to obtain commanders. Certain missions, campaigns, and Scenarios award commanders. Experienced commanders can be bought in the Arsenal for Coal or Doubloons, or from the Premium Shop for real money. Awarded ships and some purchased ship bundles include experienced commanders. When a ship is purchased from the tech tree, it can be with a newly recruited commander or without one. The latter option is useful when you intend to assign a commander from Reserve or another ship. Clicking on the Commander portrait in the top right of the Port screen brings up the Commander interface. This screen allows players to manage their Commanders in various ways. The Commander Interface: current skills (Red 1), redistribution (Orange 2), reserve Commanders (Green 3), current Commander (Blue 4), and Elite Commander experience (Purple 5). The currently selected Commander is shown in the top right; the Commander skills trained are shown in the center. The drop down menu next to the Commander's name allows players to assign the Commander to another ship, send him to Reserve, dismiss him, or Go to their Personal File. Directly below the currently selected Commander is shown other Commanders that are eligible for use on the selected ship. The toggle at the top shows either commanders currently assigned to other ships, or those that are in Reserve. The center of the Commander Interface displays the Commander skill tree — discussed in detail below — with currently trained skills highlighted. At the far left is the Redistribute function, that allows players to "respec" their Commanders by clearing their skill selections, thus allowing skill points to be assigned again. The crux of the Commander system — and the main portion of the Commander interface — revolves around the various skills available to train. Players accomplish this by earning Commander experience, then spending that experience on Commander skills. 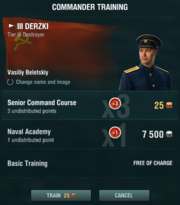 Commanders who have available skill points to spend will show unspent points in the Port screen. Commanders earn commander experience (CXP) in the same way that ships do, including any bonuses to ship XP  earnings. Additional bonuses that affect only commander XP — such as from Restless Fire  camo or the Zulu Hotel  signal — are added on top of this number. Therefore, it is possible to earn considerably more commander XP in a match than ship XP. See the Economics article for details of how CXP is calculated. Players can view how much commander XP they earned in a given match on the 'Credits and XP' tab of the post-battle report. The table at right shows the experience requirements for a Commander to buy skill points. Each commander displays his skill points overlaid on his portrait as available/total. Thus a commander with 15 points, only 3 assigned, would show "12/15" on the lower left of his portrait. Clicking on the commander's portrait brings up the Commander Interface screen (see the graphic above), where a new skill may be selected. The interface will ask for confirmation. Some skills are only useful to certain classes or to ships with certain weapon systems. Skills that are not useful to the current ship are marked as such. They may still be selected. (If a skill is not useful on the current ship, it may become so when the commander is moved to a different ship.) However, considering the amount of time it takes to train a highly skilled Commander, it is best to focus his skills on ones that are immediately useful. A complete list of skills, their point costs and effects, appears below. When training skills in Rows 2, 3 or 4, Commanders must have at least one skill trained from the previous row. Commanders are free to train any skill in a row before selecting any skill in the subsequent row; they are not confined to skills only within the sub-groupings shown below (and in the skill tree in the Commander interface). Free. An indicator is displayed when your ship is detected by an enemy ship or aircraft. All commanders receive this ability at no cost. 1 The detection indicator displays the number of opponents that are currently aiming at your ship or squadron. For a ship, the number of opponents aiming at the ship with main battery guns. For a carrier squadron, the number of ships firing their AA guns at it. This skill will not work during retraining. 1 Reduces the risk of main turrets, torpedo tubes, steering gears, and engine becoming incapacitated. -30% to the risk of incapacitation of modules. This skill does not apply to secondary or AA batteries. 2 Hastens the next availability of the ship's Damage Control Party. -10% to reload time of the Damage Control Party consumable. 2 Decreases the reload time of all ship and squadron consumables. -5% to reload time of all consumables. Stacks with other consumable reload time modifiers such as the High Alert skill or November Foxtrot ( ) signal. During retraining, a 50% penalty is applied to the effect of this skill. 3 Increases both ship and aircraft HP, including fighters, depending on the ship or aircraft carrier tier. +350 HP for each ship tier. +15 HP for each ship tier. Example: a Tier V ship would gain 1,750 (5x350) additional hit points. Has greater value on smaller ships or more fragile planes. 3 Accelerates repairs to modules, firefighting, and recovery from flooding. -15% to time of repair, firefighting, and recovery from flooding. Reduction applies only to passive repairs, firefighting, and flood control. 4 Greatly increases the effectiveness of secondary guns against the manually selected target. -15% to the maximum dispersion of shells for the secondary armament of Tier I-VI ships. -60% to the maximum dispersion of shells for the secondary armament of Tier VII-X ships. This doesn't mean manual aim; the guns still aim automatically. It requires the player to manually select a target by holding down Ctrl and left-clicking on it. With this skill, the secondaries will not fire at all without manual target selection. 4 Reduces the risk of fire. Ship can have a maximum of 3 fires burning at one time. For battleships and cruisers, this skill also caps the number of fires in the superstructure of a ship at one (whereas there are ordinarily two fire zones there). For more information on fire chance, visit the Fire page. 1 Accelerates shell type switching if all main battery guns are loaded. -50% to reload time when the shell type is switched. All guns must be fully loaded for this to have effect. 2 Increases the speed of torpedoes launched from both ships and aircraft while reducing torpedo range. +5 knots to torpedo speed. 3 Reduces reload time of torpedo tubes and servicing time of torpedo bombers. -10% to reloading time of torpedo tubes. -20% to servicing time of torpedo bombers. Stacks with other torpedo and aircraft servicing reducers, such as Air Supremacy, Torpedo Tubes Modification 3 ( ), and Flight Control Modification 1 ( ). 3 Reduces continuous damage to aircraft in all AA defense zones. -10% continuous damage See the Aerial Combat article. 4 Increases the armor penetration of high explosive (HE) warheads, while decreasing the chance of setting the enemy ship on fire. +30% to the armor penetration capacity of HE shells and rockets. -1% to chance of fire on target caused by HE shells with a caliber up to and including 139mm. -3% to chance of fire on target caused by HE shells with a caliber above 139mm. The mechanics for HE penetration can be found in the Gunnery & Armor Penetration article. Also see Armor thresholds for more specific analysis. This skill is frequently paired with Demolition Expert. 4 Speeds up the aiming of a carrier's aircraft. +5% Attack aircraft aiming speed. 1 More effective fighter squadrons. +1 Fighter. Applies to both carrier-launched and catapult-launched fighters. 2 Expands the smoke screen area. +20% to the radius of smoke screens. This skill will not work during retraining. 3 Improves the performance of smaller main guns and all secondary and AA guns. -10% to reload time of main battery guns with a caliber up to and including 139mm and all secondary battery guns. +10% to continuous damage from AA guns. Stacks with November Echo Settleseven  . See the Aerial Combat article for how AA defenses work. 3 Increases capacity of consumables. +1 additional charge to all consumables mounted on a ship. Does not affect the consumables of aircraft carrier squadrons. This skill will not work during retraining. 4 Extends firing range of main guns with a caliber up to and including 139mm and all secondary battery guns. Increases damage per second within the explosion radius of shells fired by mid- and long-range AA defenses. +20% to firing range of main battery guns with a caliber up to 139mm and all secondary battery guns. +15% damage per second within the explosion radius of shells fired from medium- and long-range AA defenses. Stacks with November Echo Settleseven  . 4 Improves the efficiency of AA sector reinforcement and decreases its implementation delay. +20% AA sector efficiency. -20% reinforcment delay. See the Aerial Combat article for how sector reinforcement works. 1 Provides a warning of long-range artillery fire. Displays a warning of a salvo fired at your ship from a distance of more than 4.5 km. Think of this as a "turn now!" warning. This skill will not work during retraining. 1 Restores the engine boost of the carrier's last strike squadron. Completely restores the engine boost for the last attack flight of the carrier's planes. 2 Increases reload speed of all armament and a carrier's squadron speeds as the ship's health decreases. -0.2% to reload times of all types of armament for each 1% of total health lost. +0.2% Squadron speed for each 1% of total health lost. 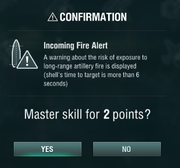 This skill affects main battery guns, secondary battery guns, and torpedoes; it has no effect on anti-aircraft armament. 2 When the engine or steering gears are incapacitated, they continue to operate (but with a penalty). The ship remains able to move and maneuver - slowly - while the engine or steering gears are incapacitated. This skill will not work during retraining. 3 Increases the chance of ship and aircraft armament starting fire. +2% chance of HE shells causing a fire on target. +5% chance of HE bombs causing a fire on target. For more information on how fire chance is calculated, visit the Fire article. 3 Extends ship's torpedo acquisition range. +25% to the detection range of enemy torpedoes. Provides additional time to react to incoming torpedoes. Stacks with both Target Acquisition System Modification 1 ( ) and Hydroacoustic Search ( ). Does not work on aircraft carrier squadrons. 4 Shows the direction to the nearest enemy. Functions on ships only. 4 Reduces detectability range. -10% to the detection radius of all ships and aircraft launched from them. Stacks with other detection range reduction bonuses such as Concealment System Modification 1 ( ) and camouflage. Players will sometimes want to change the skill selections on one of their Commanders. This is accomplished in the Commander Interface by utilizing the "Redistribute" button (shown highlighted in orange on the graphic above). Redistributing Commander skill points costs either 25 or 10,000 Elite Commander XP per spent skill point; players are not charged to redistribute unspent skill points. Upon confirming the redistribution, all currently trained Commander skills are cleared, the corresponding skill points are refunded, and players may begin assigning those skill points again as they see fit. Note that when using Elite Commander XP , up to level 7 it is cheaper to recruit a new commander and accelerate their training than to redistribute skills of an existing commander. This will also result in two commanders instead of one. On occasion — such as Christmas or other holidays — Wargaming offers sales on redistribution. Clan Battle participants have been enjoying one week of free redistribution at the beginning and at the end of Clan Battle seasons. Reserve slots — (shown highlighted in green on the graphic above) — hold unassigned commanders. Commanders in the Reserve can be assigned to any ship (of the same nation) as normal, subject to re-training costs (see below). Each player starts with four (4) Reserve slots. Additional Reserve slots can be purchased with doubloons -- normally four (4) slots for 100 . Slots are very rarely available though other means. Once trained to a non-premium ship from the tech tree, a Commander's skills can be fully utilized only on that ship. Transferring to a new tech tree ship requires the commander to re-training to that ship, which is usually accomplished by earning a certain amount of Commander XP in his new ship (see the table to the right). Normal commander training resumes once re-training has been accomplished. 500 , completing re-training instantly. 200,000 , requiring them to earn 1/2 the Commander XP normally required (see table) to completely re-train (or spend the full amount of doubloons). nothing, requiring them to earn Commander XP in order to fully re-train for their new ships. 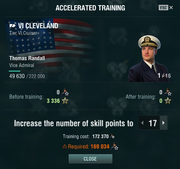 Commanders can also spend Elite Commander XP (and/or Free XP) equal to the remaining cost of re-training, finishing re-training instantly. This can be combined with the 200,000 option in order to save ECXP. Remember that while a Commander is re-training, skill effects are reduced by 50% and skills with a binary (on or off) effect are disabled. A commander can be assigned to a premium ship of the same nation at any time without undergoing re-training. His skills will continue to work at full strength on the premium ship. Commander XP earned while assigned to a premium ship counts toward re-training on his specialized ship. This makes premium ships a great way to re-train commanders while avoiding retraining penalties. The commander can be moved back to his specialized ship without penalty. A commander who earns nineteen (19) Skill Points becomes an Elite Commander. Elite Commanders continue to earn experience as do lower-ranked commanders. However, an Elite Commander no longer accumulates CXP; his experience is earned as Elite Commander Experience (ECXP) that accumulates in a common pool (like Free XP). (The current ECXP balance is shown highlighted in purple on the graphic above). As Free XP is available to all ships, Elite Commander XP is available to all commanders on a player account. Applied to any non-elite commander to gain additional skill points. Used to retrain any commander moved to a different, non-premium ship (instead of spending doubloons). Used to redistribute skill points (in lieu of using doubloons). Converted into Free XP for doubloons . After all ECXP is spent, Free XP can be used instead of Elite Commander XP . To retrain a commander, promote him to a new rank, or redistribute his skill points, the available ECXP and/or FXP must be sufficient to fully complete the operation (no partial operations). When an operation can be completed, Elite Commander XP is spent first then Free XP is used only if there is not enough ECXP. Now the player chooses to promote this commander to the maximum attainable rank using all types of XP. He has 100 CXP, 3000 ECXP, and 40,000 Free XP. The cost of the next commander rank (8) is 30,000 XP. To reach it, he spends 100 CXP, 3000 ECXP, and 26,900 Free XP (total 30,000). To reach the next rank (9), 41,000 XP is required. Since he has no CXP or ECXP and only 13,100 Free XP remaining, he cannot promote this commander to rank (9). Elite Commander XP can be converted to Free XP in the same way as Elite (ship) XP — ( 25 ECXP + 1 => 25 Free XP ). Free XP cannot be converted to Elite Commander XP. Some commanders have unique talents or modified commander skills. Check out the list of unique commanders to learn more. As a Commander gains levels, they are given ranks based on their nation. These roughly correspond to the historical ranks awarded to officers of their nation's respective navies. The table below lists these ranks as they appear in game. ↑ To recruit a commander to Reserve, temporarily move the commander of a ship to reserve, recruit a new commander, then swap back. ↑ With Update 0.8.2 this skill does function on aircraft squadrons. ↑ Free XP becomes available at Account Level 5. Commander operations and ECXP become available at Account Level 7. Since at that point the account will have no ECXP, accumulated FXP may be used in its place. This page was last modified on 24 April 2019, at 01:38.